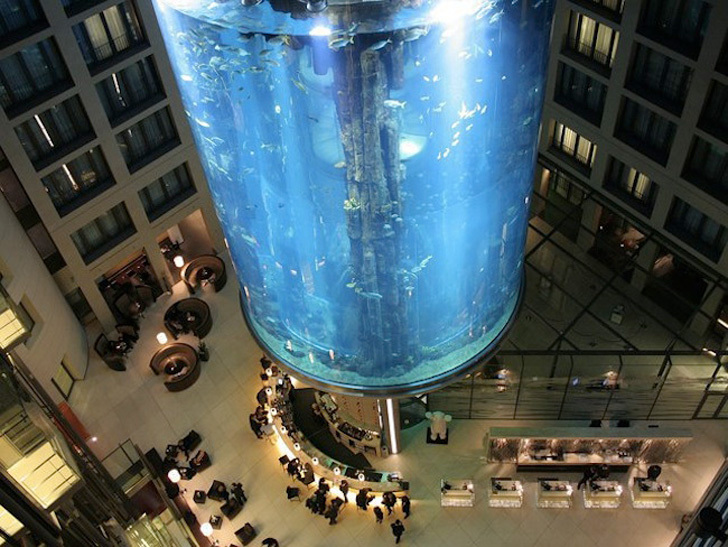 'Scuba diving in Germany' isn't usually penned into many tourists' to-do lists -- for obvious reasons -- but at the Radisson Blu Hotel in Berlin this far-fetched idea becomes a reality with their towering Aquadom aquarium. A massive construction that looks like it came straight out of a James Bond movie, this incredible aquarium reaches 82-feet high and sits in the heart of the hotel's lobby atrium. While guests can't actually go for a dive in the Aquadom (we know, we were just as disappointed to find out! ), they can enjoy the thrill of riding up the transparent glass elevator built into its core. The Aquadom is the world’s largest cylindrical aquarium. The aquarium is filled with nearly 1 million liters of seawater and has 1,500 tropical fish of 56 species and tiny reef-like mounds at its base. The aquarium is managed by the Sea Life Berlin Aquarium located next door to the hotel, and two full-time scuba divers are responsible for the care and feeding of the aquarium and its inhabitants. Guests can often see them swimming around in their scuba gear with the fish. Construction of the AquaDom was no easy feat; the acrylic glass cylinder that makes up the structure was manufactured in four pieces and built on-site on top of 30-feet of concrete foundation. The individual pieces had to be crane lifted into place during the construction of the hotel itself, and the rest of the hotel was gradually erected around the tank. Visitors are welcome to scale the tank via a glass elevator that travels up the center of the aquarium and leaves them at a viewing platform just beneath the glass roof of the hotel. Here they can enjoy the sea-like spectacle below, and take in both the Aquadom and the vast atrium space in a completely different way. The aquarium also acts as a dynamic light filter, shifting the quality and intensity of light in the space throughout the day. If you’re interested in sleeping with the fishies, rooms at the Radisson Blue run upwards of 180 Euro per night. The hotel boasts 427 suites with fantastic views of the tropical underwater world — or for those who feel they may get sea sick — rooms looking out to the city of Berlin. DUMB DUMB. What a waste of energy, water, material and money. Provide shelter and food for the less fortunate. Let the fish swim free. Let the rich scuba dive in the ocean. 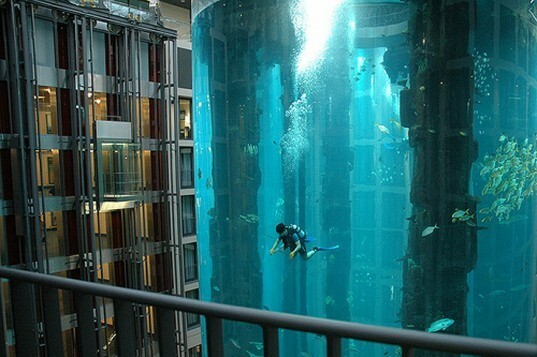 The Aquadom is the world's largest cylindrical aquarium. The aquarium is managed by the Sea Life Berlin Aquarium located next door to the hotel, and two full-time scuba divers are responsible for the care and feeding of the aquarium and its inhabitants. Guests can often see them swimming around in their scuba gear with the fish -- an added attractioN! The aquarium is filled with nearly 1 million liters of seawater and has 1,500 tropical fish of 56 species and tiny reef-like mounds at its base. Visitors are welcome to scale the tank via a glass elevator that travels up the center of the aquarium and leaves them at a viewing platform just beneath the glass roof of the hotel. Here they can enjoy the sea-like spectacle below, and enjoy both the Aquadom and the vast atrium space in a completely different way. Construction of the AquaDom was no easy feat; the acrylic glass cylinder that makes up the structure was manufactured in four pieces and built on-site on top of 30-feet of concrete foundation. The individual pieces had to be crane lifted into place during the construction of the hotel itself, and the rest of the hotel was gradually erected around the tank. If you're interested in sleeping with the fishies, rooms at the Radisson Blue run upwards of 180 Euro per night. The hotel boasts 427 suites with fantastic views of the tropical underwater world, or for those who feel they may get sea sick, rooms looking out to the city of Berlin.